For some time now, we have been aware of homelessness in our midst. In the 50’s, we called people without homes, “hobos.” The hobos were generally men who we believed chose the free and easy lifestyle of riding railroad cars and doing odd jobs for housed country folk in exchange for sandwiches. In fact, the lives of hobos were romanticized through movies, including “Emperor of the North,” staring Lee Marvin and Ernest Borgnine. 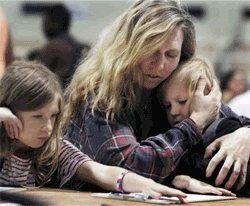 Today, the fastest growing segment of the homeless population is families, including single mothers with their children. I don’t know anyone who believes that families choose a homeless lifestyle. There is nothing free and easy about their homelessness. And there are no romantic movies being made about their plight. There’s a “homeless” what? A homeless dog? A homeless cat? A homeless person? Our choice of language is important for ourselves and for the people about whom we are speaking because it reminds us that we have a shared humanity and that realization can awaken our compassion. My question is: Why does it matter to us whether people have a home or don’t when we’re talking about them? Recently, a security guard friend of mine showed up with a bandage around the fingers of his right hand. I wished my friend well and I’ve being thinking about our conversation ever since. Aside from the fact that perhaps my friend should not have grabbed the person’s shirt, I wondered about his use of language. Why did it matter that the person he was trying to move along was homeless? Why couldn’t he have just described the person as a man? I believe that there are a number of reasons for our choice of language. At some psychological level, perhaps, we may be angry with homeless people whom we believe have failed to live up to what society requires of them to be housed. We may also resent that homeless people are living off the benefits of society that we housed people have supplied. And, perhaps the most prevalent reason for our choice of language is that we may be afraid that, pretty much like feelings of old about cancer, if we speak about homelessness we might “catch it” and become homeless ourselves. Of course, homelessness is not catching, but in this economic climate many of us, dare I say, most of us are one paycheck away from becoming homeless ourselves. Economic instability creates a great deal of fear in us. I’m no psychologist, but it seems to me that we are unconsciously transferring our fear of homelessness from ourselves to the visual presentation of our fear, homeless people. The word homeless also gives the false impression of a simple solution. Plus it allows us to throw up our hands, and say that we can’t give them all homes. Maybe if we called them campgroundless or storageless, then we aim for workable solutions. For starters we need more storage facilities, like the Waterman Center.